A 21st-century take on the “coming of age” genre, 2018’s Love, Simon introduces us to the title character, Simon Spier (Nick Robinson). 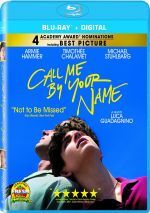 A teenaged high school student, Simon hides his homosexuality from friends and family. When Simon falls for a guy named “Blue” online, though, matters change. Supposedly a classmate, Simon wants to discover Blue’s identity, and this threatens his secret. Going into Simon, I feared it would seem dated, as the concept of a kid who finds it anxiety-provoking to come out as gay feels more 1990s than 2010s. 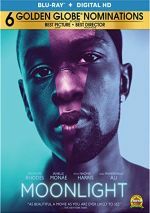 Acceptance of various sexual orientations jumped massively over the last few decades, so I worried whether the film still feel “real” in this era. Simon reminds us that despite all the strides gay rights have made over these years, it’s not universal. Sure, it’s much easier for kids to come out now than it was when I attended high school in the 80s, but it’s still a big leap to make, and the film gives us a good depiction of that. Nonetheless, I find it hard to firmly call the movie “realistic” just because it gives us such an idealized set of characters. Simon himself is a 2010s hipster dream kid: handsome, smart, and he listens to 1960s Kinks! Do kids like this actually exist? 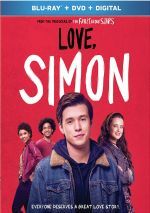 Perhaps the filmmakers wanted such a content, confident lead to illustrate the challenges that still accompany coming out, but Simon still feels less than universal. At the start, he claims to be “totally normal just like you”, but it’s clear he’s not. Simon shows one massive influence: John Hughes. Born in 1972, director Greg Berlanti came of age during Hughes’ primary period of success, and the film makes it clear those experiences rubbed off on him. The Hughes vibe pervades Simon to an enormous degree, one that Berlanti clearly acknowledges. As I write this, I’ve not listened to the audio commentary yet, but I’ll be shocked if he fails to cite the Hughes influence there – crud, the movie’s last shot offers an extremely conscious nod toward Ferris Bueller’s Day Off. I get that Hughes made a massive mark on teen movies and filmmakers of Berlanti’s generation, but I wish Simon came across as less of an homage. It emulates the Hughes model to a near slavish degree and feels more like a 21st century imitation than its own statement. It doesn’t help that Berlanti creates a loooong riff on Hughes as well, for Simon’s 110-minute running time feels excessive for this particular story. The movie finds itself overly preoccupied with supporting characters, a trend that comes with two negative repercussions. One of those relates to the aforementioned excessive running time. In truth, Simon provides a basic story, one that could easily be captured in an hour-long TV special, honestly. This means all the time with the secondary roles feels like padding. Sure, we get to know a bit about Simon’s friends and family, but the movie appears more concerned with them too much of the time and the main narrative too often falls to the wayside. In addition, Simon himself frequently semes ill-defined. Perhaps this occurs intentionally to leave him as an “Everyteen” with whom other closeted kids can identify, but it backfires because we never really bond with Simon beyond a superficial level. He seems rough-drawn here and not especially compelling. I have to admit Robinson looks awfully old to play a high school student, too. He was actually only 22 during the shoot, so we’re not exactly in Stockard Channing territory, but Robinson still resembles a much older guy, and this makes the leap of believability more difficult. In the end, Love, Simon brings us a decent message of empowerment. However, it takes far too long to get there, and the film feels too much like fantasy for its purpose to stick as well as it should. 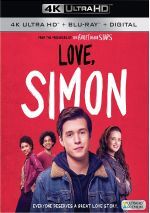 Love, Simon appears in an aspect ratio of approximately 2.39:1 on this Blu-ray Disc. This turned into a strong presentation. Sharpness looked good. A few interiors came across as a smidgen soft, but these majority of the film demonstrated appropriate clarity. No concerns with jagged edges or shimmering occurred, and edge enhancement remained absent. Source flaws also failed to create problems. In terms of colors, Simon tended to stay with a light teal and amber palette. Within those constraints, the colors appeared pretty clear and concise. Blacks were deep and firm, while shadows showed good delineation. Overall, this was a pleasing transfer. I thought that the DTS-HD MA 5.1 soundtrack of Simon seemed fine but it didn’t excel because of a lack of ambition. Like most romantic comedies, the movie featured a limited soundfield that strongly favored the forward channels. It showed nice stereo spread to the music as well as some general ambience from the sides. Panning was decent, and the surrounds usually kicked in basic reinforcement. A few scenes opened up better, though, such as those at a party or at a fair. However, most of the movie stayed with limited imaging. Music was perfectly fine, as the score and songs showed positive dimensionality. This track was good enough for a “B-“ but didn’t particularly impress. Among the set’s extras, we find an audio commentary from director Greg Berlanti, co-writer Isaac Aptaker and producer Isaac Klausner. All three sit together for a running, screen-specific look at the source novel and its adaptation, story/characters, music, editing, camerawork, sets and locations, influences, and related domains. Expect a chatty, engaging track here that covers the movie well. The three participants interact in a smooth manner and help give us a lot of useful information about the film. Two Deleted Scenes appear: “Lying to Abby” (1:58) and “Gay Bar” (5:53). The first expands Simon’s ruse to push Abby toward Martin, while the latter depicts Nick’s attempt to support Simon. “Lying” entertains but seems redundant, as it gives us more than we need. “Bar” adds some to Simon’s post-coming-out life and seems interesting on its own, but it would’ve slowed down an already excessively long movie. A few featurettes follow, as we launch with The Adaptation. This delivers a 10-minute, 41-second piece with info from Berlanti, Aptaker, producer Pouya Shahbazian, author Becky Albertalli, and actors Jennifer Garner, Keiynan Lonsdale, Katherine Langford, Josh Duhamel, Logan Miller, Jorge Lendeborg Jr., Alexandra Shipp, Miles Heizer, and Nick Robinson. As expected, we learn about the source novel and its move to the screen. It lacks a lot of depth. With The Squad, we find a nine-minute, 46-second reel with Berlanti, Robinson, Shipp, Langford, Lendeberg, Miller, Shahbazian, and Albertalli. We learn about cast and characters in this fluffy reel. #FirstLoveStory Contest Winner fills one minute, 34 seconds and shows a short film. It’s decent. Two similar pieces follow: Dear Georgia (5:07) and Dear Atlanta (2:06). In these, we hear from Berlanti, Robinson, Langford, Shipp, Albertalli, Lonsdale, Garner, Duhamel, Lendeborg, Miller, and executive producer Timothy M. Bourne. Both look at sets and locations. “Georgia” includes a few good details but “Atlanta” just acts as a promo reel. A Gallery includes 24 still frames. These provide shots from the set and they become a mediocre compilation. The disc opens with ads for The Greatest Showman, Maze Runner: The Death Cure and the novel Children of Blood and Bone. We also get two trailers for Simon. A second disc provides a DVD copy of Simon. It includes the same extras as the Blu-ray. At its best, Love, Simon can offer a breezing, charming tale of personal empowerment. However, the movie runs far too long for its own good and it seems too anonymous to really connect. The Blu-ray brings solid visuals along with adequate audio and supplements. Simon becomes a spotty update on the John Hughes formula.